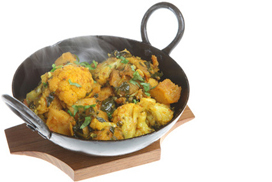 A favourite traditional vegetable curry, a nice way to give cauliflower some flavour and it goes so well with the potato. Add in the potatoes and half a mugful of water and cook for 5 mins or until potatoes are cooked part way through. Add more water if needed to stop the masala sticking or burning. Add in the cauliflower and cook for a further 5 minutes or until the cauliflower is cooked to your liking.